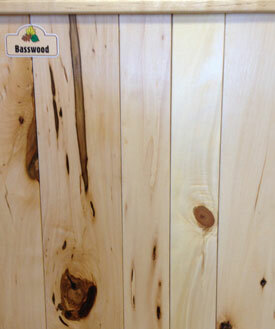 Basswood | aka: linden, American linden, lime, lime tree, American white wood. The sapwood of basswood is usually quite large and creamy white in color, merging into the heartwood which is pale to reddish brown, sometimes with darker streaks. The wood has an indistinct grain that is straight and has a fine, uniform texture. Basswood machines well and is easy to work with hand tools, making it a premier carving wood. It nails, screws, and glues fairly well and can be sanded, and stained, to a good, smooth finish. It dries fairly rapidly with little distortion or degrade. It has fairly high shrinkage but good dimensional stability when dry. Carvings, turnings, furniture, pattern-making, moulding, millwork, and musical instruments. Specialized uses are Venetian blinds and shutters.